The Technical Traders Ltd. research team has been on top of nearly every move in the metals markets over the past 12+ months. 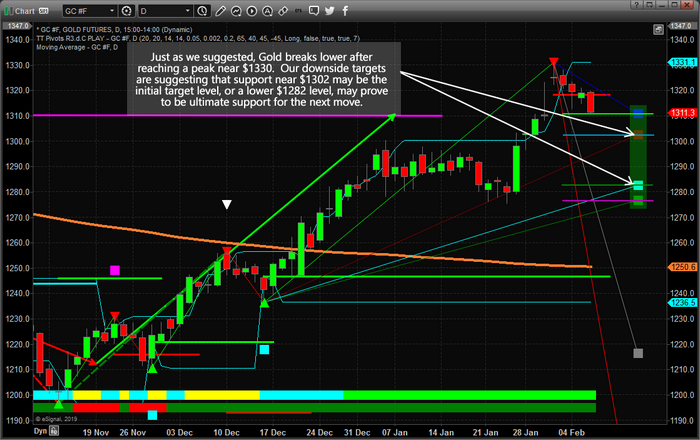 On February 1, we posted this article: Get Ready For The Next Big Upside Leg In Metals/Miners . In this post, we suggested that the recent peak in Gold, near $1330, would likely end and prompt a downside price rotation over the next 45+ days. Subsequently, on January 28, we posted this article: 45 Days Until A Multi-Year Breakout For Precious Metals . In that post, we highlighted our predictive modeling systems support of a sideways price correction in the precious metals markets that would align with US stock market strength and US Dollar strength.